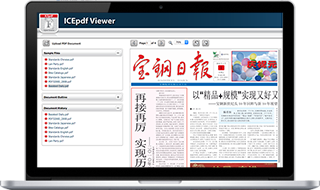 ICEpdf is a Java-based PDF viewing and content extraction library used in thousands of projects worldwide. Advanced Asian-font rendering, user annotations, and forms support make it an ideal choice for enterprise projects. Rapidly integrate a robust PDF viewing solution into your application. Supports user annotations and interactive form controls. High-performance parsing engine for efficient bulk search and extraction of text and image content from within PDF documents. ICEpdf’s core library is open source and easily extendable for the adventurous. ICEpdf Pro adds additional enterprise-grade features and professional support options. The Servlet Viewer Example demonstrates the flexibilty of the ICEpdf rendering core in a web-based application. Explore ICEpdf’s rich set of interactive features by trying our Java Web Start demo. This ICEpdf Demo requires that you have Java Web Start (JWS) installed on your computer. If you don’t have access to JWS you can view a brief feature video here. ICEpdf Professional Edition is engineered to provide the additional features and support demanded by enterprise-grade solutions. Adds support for embedded fonts, ensuring PDFs are rendered as the author intended. Desktop viewer includes interactive form controls for intuitive editing of PDF forms. Specially optimized lexer to make short work of large/complex content streams. Added annotations and form field edits can be saved via an incremental update to the original PDF. Ensure the success of your project via certified releases and support packages providing expert advice and available emergency patches. ICEpdf Pro has been successfully deployed into a wide-range of mission-critical applications by numerous Fortune 500 companies. CTO, CIO, Chief Architect, Fancy Data Systems Inc.
Take a closer look under the hood to discover why ICEpdf is the right solution for your project. Use the ICEpdf Community Forums and Wiki to help you get up and running as quickly as possible. Comprehensive developer and API documentation gets you the information you need, when you need it. Easy-to-understand examples for a diverse set of use-cases are provided. Easily find and leverage working code that solves your problem. We’re happy to show you why hundreds of companies worldwide trust ICEpdf.